In the last Blog post I showed what I believe is a genuine Bulls Head (of course, I need to get a Certificate and hope to do so). 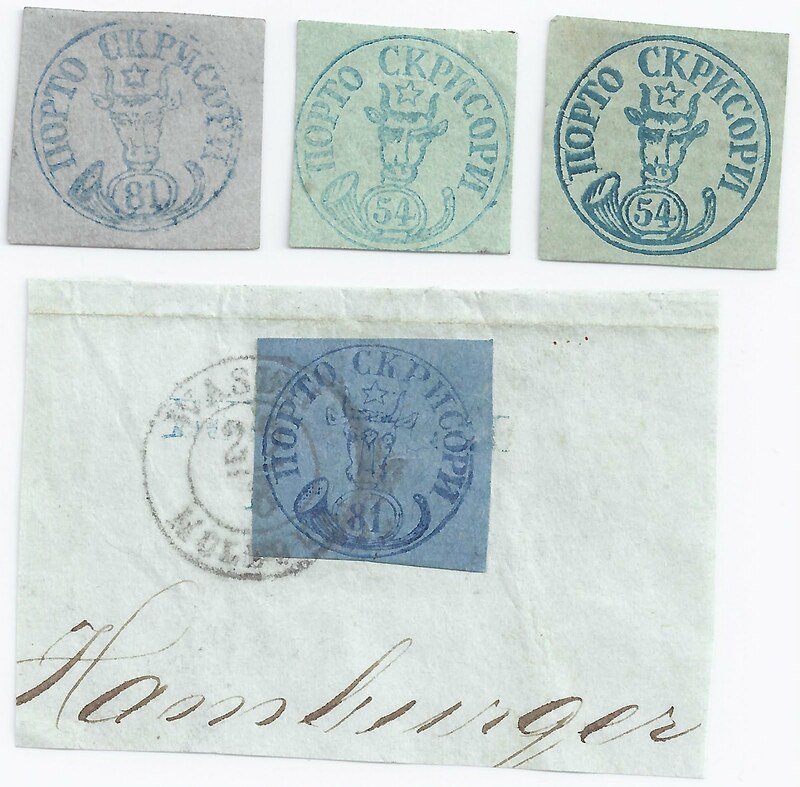 The price of getting this stamp was that I had to buy the forgeries shown above. The two forgeries of the 54 Parale are not really serious: for example,the "4" in "54" is closed. It should be open. That is like a Big Mistake. The 81 Parale in the top row is trying harder but when I compare it to the colour illustrations in Heimbüchler, I notice first of all that the ears are quite wrong. Also, the left foot of the "P" of "PORTO" does not have the characteristics decribed by Heimbüchler - the left foot should be sloping away to the left. Regarding the color of the Moldavian postmarks, there are known in romanian archives specimens for almost every week, during the the usage of the first and the second issue of the Bull Heads. A comprehensive study about this was published by Romanian expert Kiriac Dragomir in "Filatelia" magazine.